Koh Racha Yai is a great place to go diving, whether by diving day trip or liveaboard cruise. Koh Lanta diving boats generally visit the dive sites of Hin Daeng, Koh Haa, Phi Phi and east of Phuket, but here down at Koh Racha Yai, there are some wonderful diving opportunities, most of which aren’t crowded with divers. Green Turtle (Eretmochelys Mydas) Photo by Emmy AhlénEasier to dive than its sister island, Racha Noi, Racha Yai is home to several dive sites on its east coast and a couple in bays on the northwest corner. Generally, the diving is in crystal-clear turquoise waters and enjoyed by divers of all levels. There are lots of interesting and exciting fish, reptiles and invertebrates to see, and colourful healthy corals. Racha Yai is quit a distance from Koh Lanta, but not much further than the likes of Koh Doc Mai and other Phuket dive sites. What makes it worth the effort is that there are usually fewer other divers and boats there compared to King Cruiser Wreck, Anemone Reef, and Shark Point. In addition, with a lot less human activity, the air and sea tend to be cleaner and fresher, along with more visible stars at night for those lucky enough to be on a Koh Lanta liveaboard cruise. The location is far enough away to allow a more laid-back way of life for tourists, locals and possibly even the animals in the sea. The conditions are certainly better off for being 20km from the large and busy island of Phuket. However, it’s not so far that getting there and back, even from Koh Lanta, is a big deal. Although not many Koh Lanta diving boats visit Koh Racha Yai, if given the opportunity to dive there, it is very enjoyable. Clown Anemonefish (Amphiprion Occelaris) Photo by Emmy AhlénIn the northwest corner of the island there are a couple of bays which is where the main accommodation is. Here there are a couple of dive sites, partially protected by the bays, but still a bit exposed to the open sea out to the west. On the east side, there are several dive sites dotted down the coast, interspersed with fields of staghorn corals. The diving here is not too challenging, especially compared to Racha Noi and some of the more extreme dive sites in the area. They can be compared to Koh Phi Phi dive sites for difficulty, but tend to have more sloping sandy bottoms, whereas Phi Phi has more vertical limestone walls. 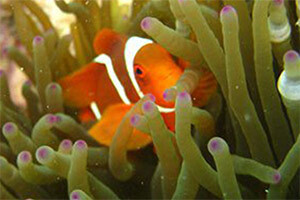 Marine life is generally abundant and healthy at Racha Yai. The corals appear almost unaffected by the 2004 tsunami or illegal and damaging fishing methods. 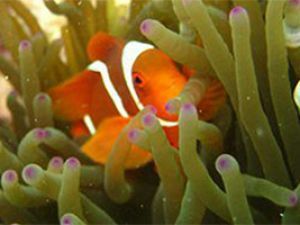 Because of this, the fish and invertebrates which live in or feed at the reefs tend to be in large and diverse numbers. There are various species of small and medium-size sharks, such as Leopard / Zebra Sharks (Stegostoma fasciatum). 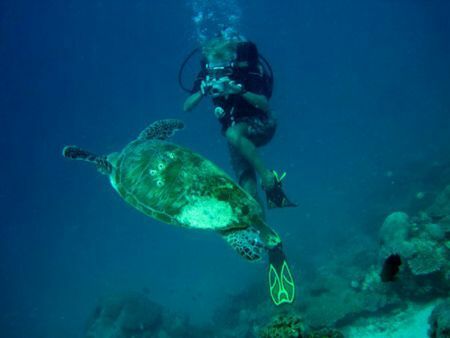 Sea Turtles, such as Green (Chelonia mydas) and Hawksbill (Eretmochelys imbricata) are also often spotted from time to time. Invertebrates and reef fish are too numerous to list, and there are several mid and large size pelagic fishes which visit the reefs here. Overall, Koh Racha Yai is an underrated location for good diving in the Phuket area. While Koh Lanta diving centers tend to visit other places instead, those which do come here nearly always return with happy customers.